Select the "Import", "Format DXF into template" item in the program menu ("File") and then select the file to be imported. 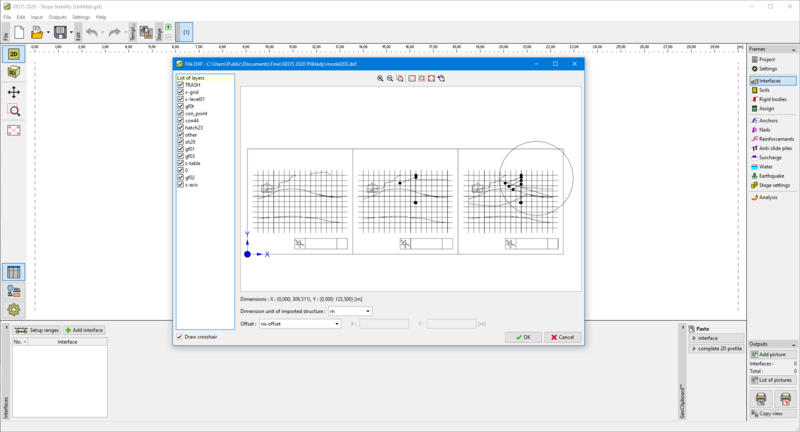 The loaded data is displayed in the dialog window DXF Import and then is read into the template. The layer selection can be modified anytime. When importing data, it is possible to adjust the world margins based on the imported data - this is particularly useful when defining a new task. Imported data is not transferred directly into the program. Instead, it is read into a template, which is used to transfer data into program later on. When the data is loaded, the template is displayed on the desktop and the buttons on a horizontal tool bar, which are used to manage the template, are made available.